‘If these thoughts interest you for even a moment, you are lost’ – L.C. 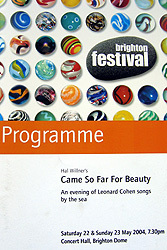 This second outing for Hal Willner’s all-star tribute show featured Nick Cave, Rufus and Martha Wainwright, Jarvis Cocker and many more, and some of the performances were later featured in the excellent 2006 film/soundtrack Leonard Cohen – I’m Your Man. 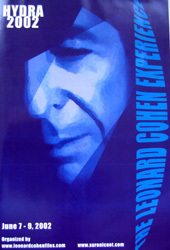 I originally posted the full text to the Leonard Cohen Forum and then offered it to the Leonard Cohen Files, who linked to the original Thoughtcat page. Cohen band singer Julie Christensen later got in touch asking “whether I’d mind” if she sent the report around her mailing list, and posted a link to the review on her blog calling it “a good report by a likeable blogger named Richard”. Perla Batalla’s management also emailed me to put me right on a couple of points after it was published. A slightly breathless account written for The Leonard Cohen Files, where it’s hosted. An account of attending this Royal Albert Hall show from The Future tour, written to ‘bulk out’ a transcript of a TV interview on Later with Jools Holland from the same time, which I did for Speaking Cohen circa 2000. See an extract from the interview on YouTube. Thoughtcat puts Arthur Smith right in 2000. 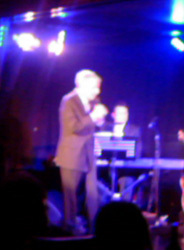 For the record, I did go and see Arthur’s one-man Cohen show, and it was excellent – I’m just a pedant. The articles I refer to in my letter are Has anyone here seen Leonard? (actually now returns a ‘sorry, we can’t find that’ result, possibly because Smith only sanctioned its web use for a limited period after the print publication) and Duck gets the bird from West End show.